A true cook’s worth isn’t measured in dollars or euros. It is not defined by one’s stock portfolio or their ability to evade taxes. Gold bars hold no value. Ingredients are our only currency. We barter in dried morels, hoard vanilla beans and are as stingy as Scrooge when it comes to matcha. The pantry is our safety deposit box. The downside is that we value these ingredients so highly that sometimes they never get used, which is no different than not having them at all. It’s truly a sin to let caviar age or an expensive bottle of Italian olive oil long for daylight. There is no better day to break loose those cherished ingredients than on Valentine’s Day. Your significent other will know you mean business if you’re willing to part ways with one of your most prized possessions. Today, I let go of some Spanish saffron that has been burning a hole in my cabinet for a while now. 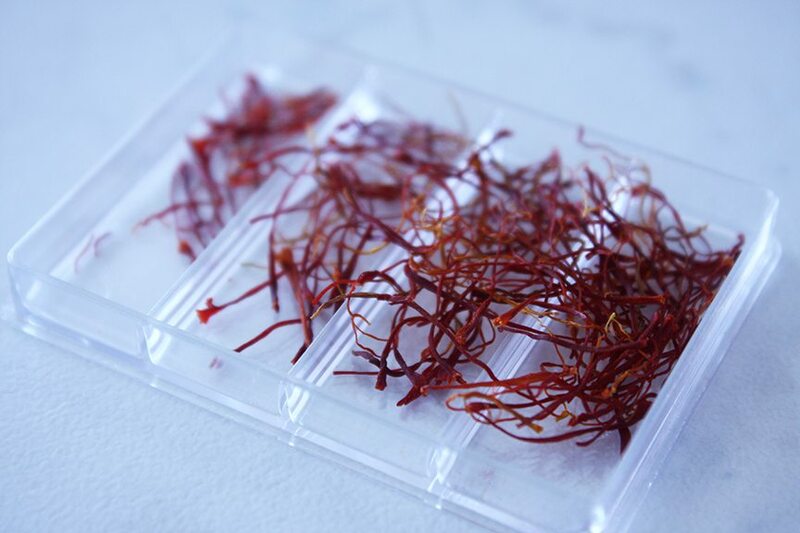 Since saffron is such a powerful (and pricey) spice, it had to be the star of the show. These scones scream saffron. The cream used to keep the scones moist and delectable is first infused with a couple pinches of this beautifully floral spice before incorporation into the dough. Then just before they hit the oven, they are glazed with more of the saffron cream and a good sprinkling of sugar. Once the hot scones are released from the oven, a dab of vanilla bean butter, which quickly melts running in and out of the scone’s crevices, sends them me over the edge. The first step to recovery is admitting you have a problem. What precious ingredients do you have hidden away in your pantry? 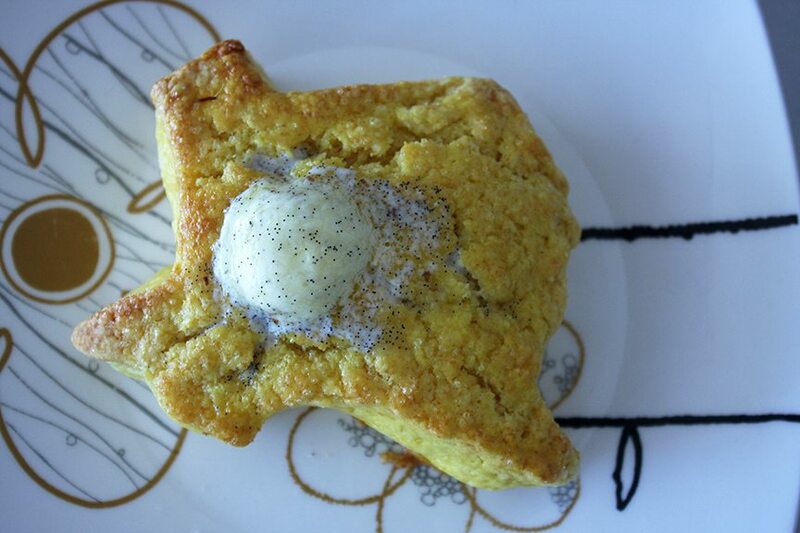 I used my Texas cookie cutter for these scones because nothing says “I love you” like food shaped like Texas. In a small pot, combine saffron and heavy cream. Heat on medium, swirling cream every minute or so until cream begins to bubble around the edges. Remove from heat and let sit for 15 minutes. 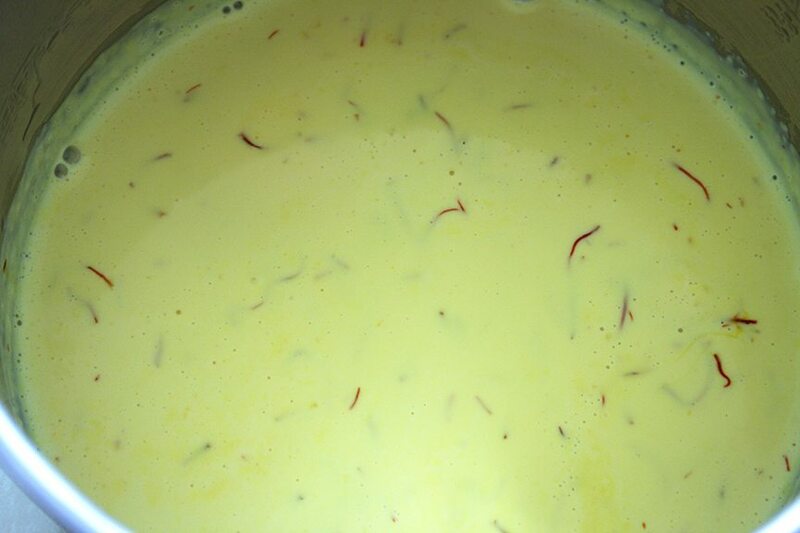 As the cream cools, it will continue to infuse with saffron. The cream won’t be strained as that would be an abomination. Moving on. Preheat oven to 350F (176C). Combine flour, baking powder, sugar and salt in a large bowl. Add cold cubed butter. Using what this world gave you, rub the butter into the flour with your fingers until no pieces of butter remain and it looks mealy. You may also do this with the paddle attachment of a mixer. 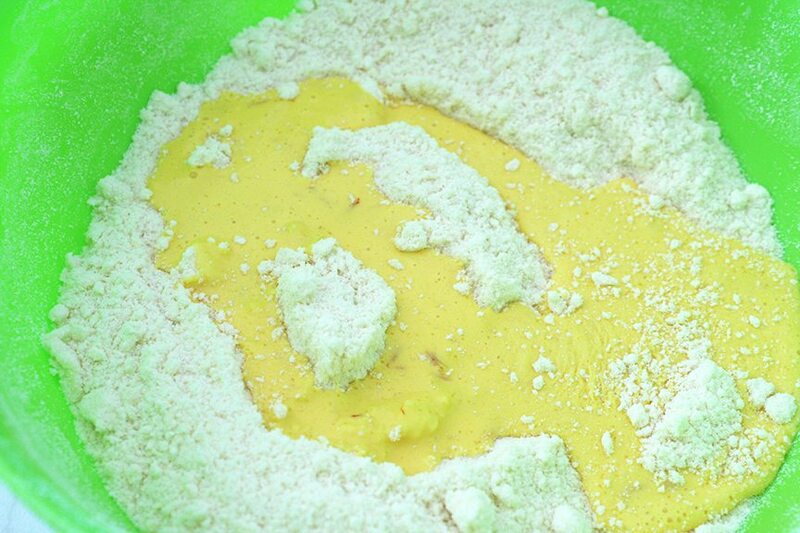 Once the cream has cooled, add the egg and egg yolk then whisk to combine. Pour 2/3 of the liquid into the dry ingredients. Do not add all the liquid at once. It will not all be needed. The amount of liquid needed depends on the moisture level of your flour. That level can vary depending on the weather, the part of the world you live in, and the climate of your house. Never fear! It may sound complicated, but this is one of the easiest pastries. Information is power, my friends! Using a fork (or mixer), gently stir to combine. The egg and cream will start to combine with the flour mix hydrating it throughout. Don’t mix longer than a minute or two, or you’ll have tough scones. The scone dough will be done when it starts to clump and pull away from the sides. If there are a lot of bone dry crumbs at the bottom of the bowl, then add a tbsp at a time of the reserved cream mixture until thoroughly hydrated, but not wet. Reserve the extra saffron egg cream. 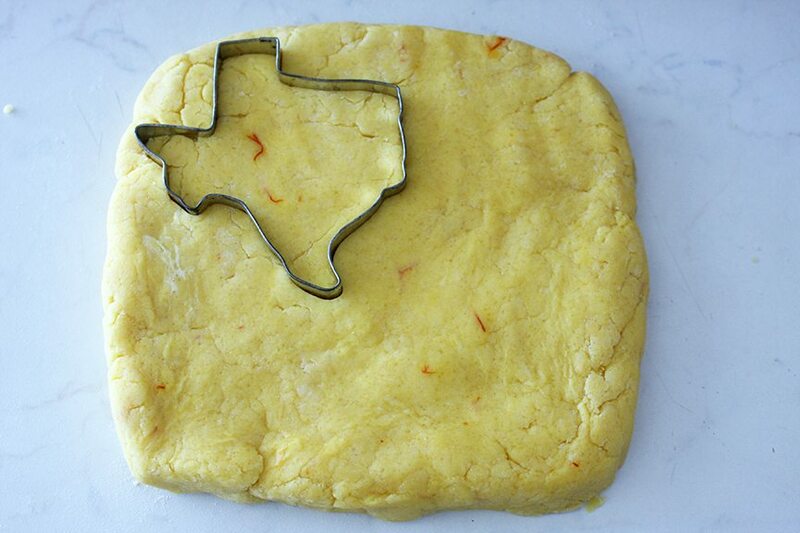 Move dough to a cutting board. Roll, or pat, out dough to approximately 1″ high. Then cut as desired. 2″ x 2″ squares is a good size, as the scones will double in size when baked. 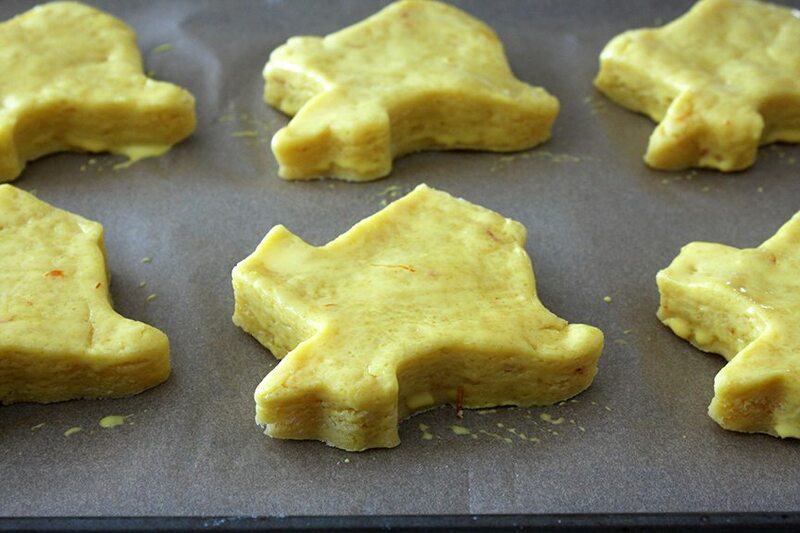 If using cookie cutters, you can fold up the scraps and roll them back out 1-2 times to get more scones. Place scones on parchment-lined baking sheet. 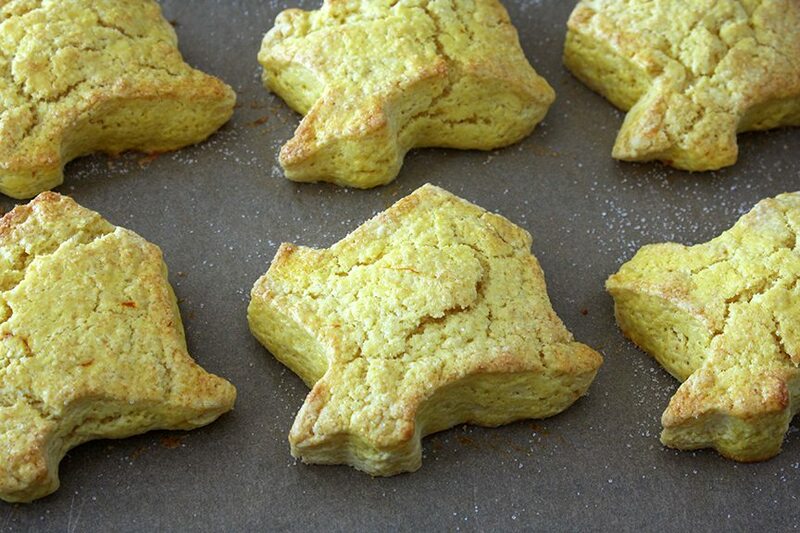 Use the reserved saffron cream and egg mixture to glaze the top of each scone, then sprinkle each with sugar. Bake for 7m. Rotate pan. Bake for an additional 5 to 8m (depending on the size of your scones) until golden around the edges and the scones still give only a little when gently squeezed. Unbaked scones (without cream glaze or sugar topping) keep in fridge for 5 days and in the freezer for up to 3 months if wrapped tightly. Baked scones are best day of, but can be refreshed in a 350F (176C) oven for 3m the next day and will be perfectly tasty. So make a ton, and keep them unbaked in the freezer for a rainy day. 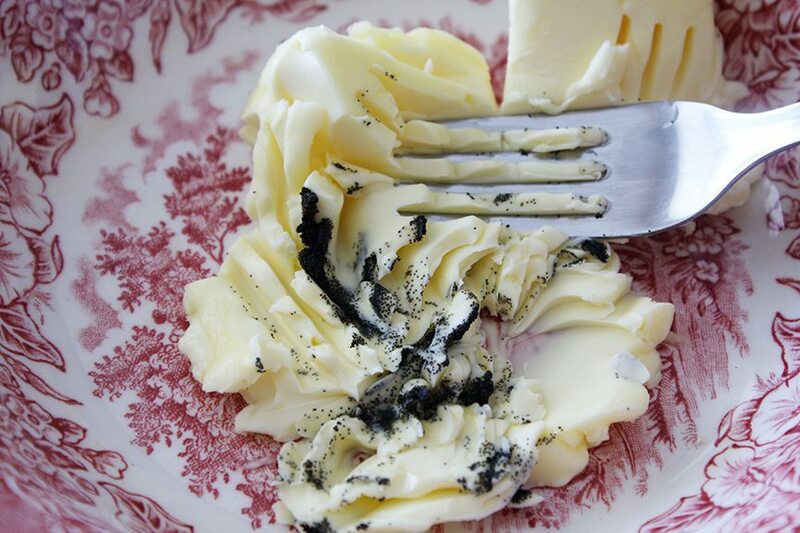 Using a fork (or your mixer), combine butter with scraped vanilla bean insides until fluffy and vanilla is fully incorporated. Butter can be frozen for months if wrapped tightly in plastic wrap. I’m going to have to try this recipe. Thanks so much! this was a fabulous recipe!